The Boston Marathon bombing is not history, yet. On April 24, 2013 I was in Boston’s Back Bay neighborhood for a Marathon bombing fund raiser. As I left the event I walked slowly down Boylston Street, passed the makeshift memorials at the site of both explosions, and then on to Copley Square. I paused for a moment to take it all in and to feel the gravity of life, death, and the celebration of this resilient city. Then the public historian in me wondered what would become of the objects at Copley Square, the outpouring of gifts that were flooding City Hall, and the memory of those left behind. On April 19, 2014 I got my answer. One year after the 2013 Boston Marathon bombing the city stopped to remember, commemorate, and continue healing together. 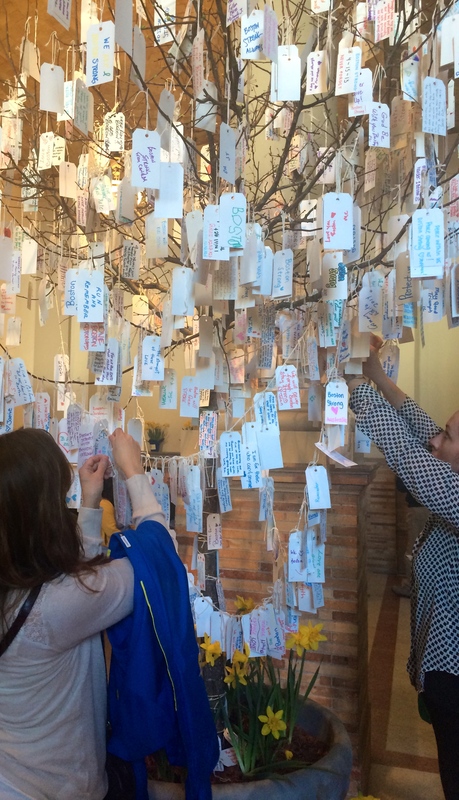 The Boston Public Library hosted an exhibit curated by Rainey Tisdale entitled Dear Boston: Messages from the Boston Marathon Memorial, which was made entirely from the Copley Square memorial objects. In June 2013 the objects were removed from Copley Square and stored at the Boston City Archives. Displaying the objects on the one year anniversary of the bombing served as a way for Boston locals and marathon participants from all over the world to revisit the spirit of the memorial. The same weekend an organization from Northeastern University came to the Boston Public Library to record written and oral histories as well as photographs, videos, and social media from anyone who was affected by last year’s bombing. On Saturday April 19th I met them there to volunteer with their project entitled “Our Marathon.” This project aims to gather data from any and all voices who want to share their story, their perspective. I had the honor of assisting the oral history consultant, Joanna Shea O’Brien, as she interviewed those affected by last year’s tragedy. It was aw inspiring, moving, heavily emotional, and therapeutic. As an act of solidarity the Boston Museum of Fine Arts opened to the public free of charge the Saturday before Marathon Monday 2014. 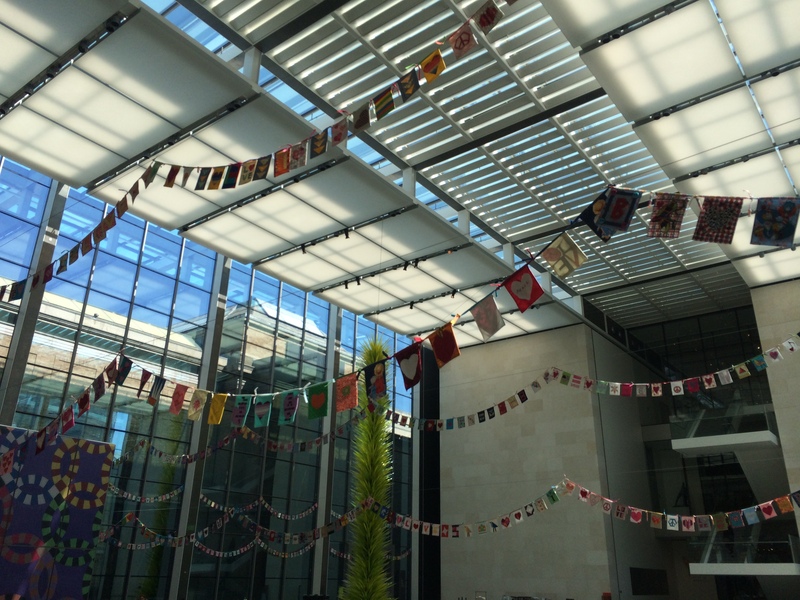 In the center of their museum stood an artistic display entitled To Boston With Love, featuring flags that were dedicated to the city. Soon after the Boston Marathon bombing Berene Campbell of Vancouver, Canada organized a quilting project. Over 1,700 flags came from every part of the world. 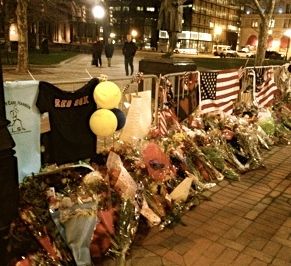 This display served as a remembrance dedicated to those who reached out to Boston one year earlier. Additionally, the media continued to serve in the capacity of living archive during the weekend leading up to the 2014 race. Television networks, newspapers, and radio stations communicated the stories of the hour, in real time. In many cases they supplemented with analysis and speculation but their sources also serve as a recounting on events. Their data is stored in their own archives and will no doubt be a sources of reference for years to come. 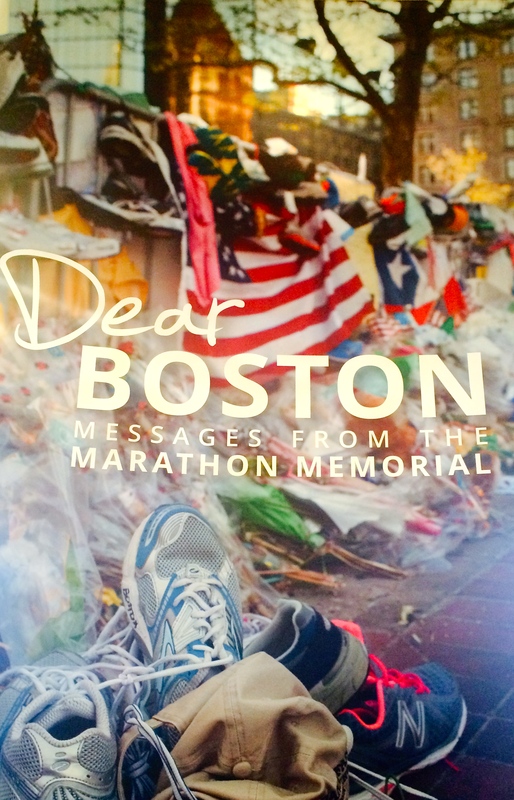 Out of all of the commemorative events of the Boston Marathon’s 2014 weekend, the Dear Boston exhibit provided the most reflective interpretation from a public history professional. As it were, the display was less a history exhibit and more a re-memorializing of the present. The Copley Square memorial was created merely one year ago. Sure, by definition this was in the past. But it is far from history. 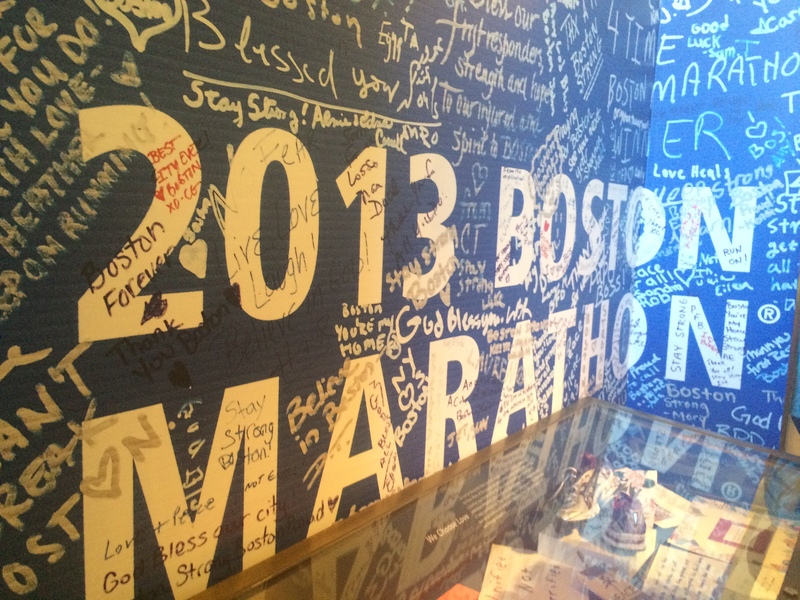 The healing process was still very present at the 2014 Boston Marathon. In a fitting tribute the exhibit did not regale the story of the bombing, the Tsarnev brothers, or every moment of April 15th-20th, 2013. Instead, it served one simple purpose: re-posting the objects found at the Copley Square memorial. All of the selected memorial objects were segmented into organizational themes that led viewers through the space but, properly, did not provide anything that the memorial did not offer within itself. While the exhibit text was written in a style befitting a traditional history exhibit, in practice these words merely guided visitors through the memorial viewing. In this regard the exhibit represented more than it interpreted, fitting for an exhibit posted only one year later. In the end, the memorial exhibit gave visitors one more way of reflecting on their own grief and the grief experienced by others. Running shoes were used as the centerpiece of the exhibit and served as an immediate reminder that the bombing happened at a powerful international sporting event with a long history. 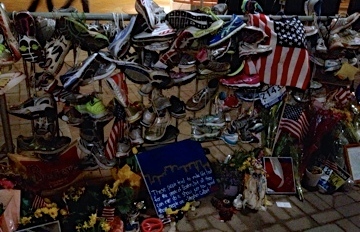 Time will reveal the connected legacies of the Boston Marathon and the 2013 bombing, but for now, Tisdale’s interpretation placed the shoes within their current context based on simple facts, “Running shoes were what distinguished the Boston Marathon bombing’s makeshift memorial from those commemorating other American tragedies. 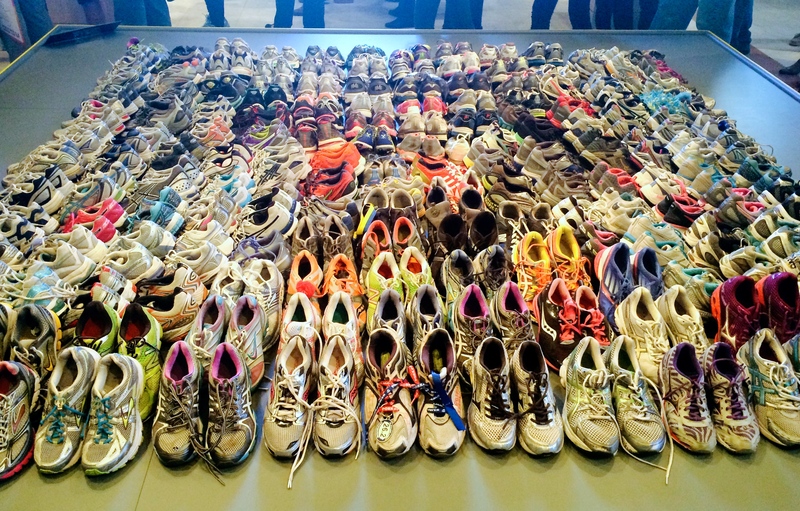 Hundreds of runners left their shoes, a clear symbol of their identity as runners, at Copley Square.” She identified three short meanings to the shoes: running gear, good luck charms, and eulogies. This interpretation was garnered from the writings on the shoes and the donator’s basic act of placing them at the memorial. For now, each pair of shoes is left to tell their own, more complex story without an elaborate interpretation and will remain a valuable part of the memorial collection. The act of stopping long enough to catalog and record the immediate reactions to a presumed historic event is intensely important but does not happen everywhere or all the time. So why did it happen in Boston? The scale of the event certainly played a role. Communities often feel a strong need to memorialize and document when the event has a traumatic and widespread impact. Archivists and oral historians followed a very similar process in New York after 9/11 and in Oklahoma after the Oklahoma City Bombing of 1995. Also, Boston has an abundance of resources to support this project. More than sixty universities or colleges exist within the metro area, providing no shortage of historians, archivists, library scientists, and public historians. Boston is also home to a large number of history museums and historic sites and is a community that greatly supports the practice of displaying and interpreting history. Additionally, the city collectively placed a priority on preserving the memory of the Boston Marathon bombing as several sources stepped up to provide the funding. Boston knows its history intimately, and some day the Boston Marathon bombing will be part of the fabric of that long and famous historic narrative. One day Boston, Massachusetts, New England, the United States, and athletes worldwide will be able to gain true perspective on the events of April 15, 2013. In his book, American Gospel, Jon Meacham proposes that an event cannot be considered history until at least twenty years have passed. While this number is a bit arbitrary, he might just be on to something. Twenty years is a span of time long enough for a generation to come of age and to gain perspective. For now, the Boston Marathon bombing is an open wound, a healing wound. We are musing through the ongoing shock and grief that comes with being exposed to terror and becoming vulnerable to fear. And archiving has become part of the therapeutic process. 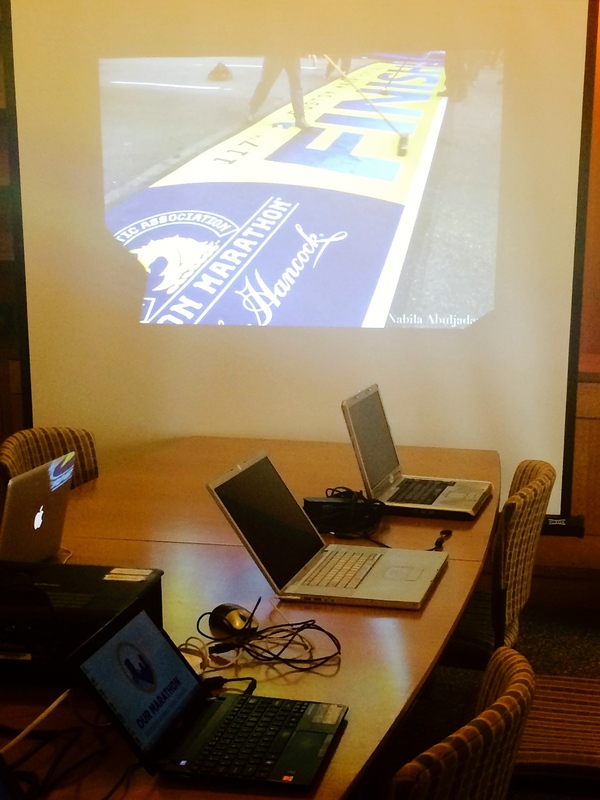 On the one year anniversary of the Boston Marathon bombing, archival efforts provided a chance to stop in real time and reflect. What we have seen from the past year is an exercise in recognizing that history is not just about recording the past, it is also about capturing the present. Twenty, fifty, and one hundred years from now historians are going to be thankful that the media, archivists, and museum professionals stopped long enough to record the present and near past. By gathering data close to the event, archivists are able to capture details and emotions that may become trapped over time. In fact, if I know historians, they will wish more had been done. Every piece of data is one more piece of a story that will not only help historians explain what happened but why it happened, who was affected, and what we can learn moving forward. However, despite the benefits, there are also detriments to capturing recent memory. The collection of recent memory has to be seen for what it is, recent. The brain has a funny way of handling trauma; some of the memories may be trapped until the body is more equipped to handle the data. For many, the wounds are still healing and they are not yet ready to discuss certain elements of their experience. Additionally, the value of perspective that comes with hindsight is still many many years in the distance. As the Dear Boston exhibit demonstrated, the depth of current interpretation cannot go beyond a simple retelling of the facts. For this reason historians would benefit if data collection was practiced until all stones are unturned. Ideally, it can continue until those affected are no longer living as archiving is an ongoing process with many layers, just as memory is. This is a tall task and one that is rarely if ever practiced. Most communities do not produce the available resources to gather data in this format. But the due diligence would be worth it in the long run as the value of learning from the past is too great to measure. Perhaps the greatest use of sports history in this very present moment can be found by contextualizing the Boston Marathon Bombing within the context of other sports tragedies. Boston Globe writer John Powers poetically placed the Boston Marathon bombing against the backdrop of previous sports tragedies. One day before the 2014 Boston Marathon The Boston Globe ran his article entitled “Marathon’s Return Will Help Prove that Tragedy is Temporary.” Powers referenced key moments in sports history where communities rallied around a sports team to find solace, healing, and forward movement. He proposed that if history repeats itself, the very nature of holding the 2014 marathon would serve as a means of running forward, away from the bombing’s past and towards a sense of redemption. So far all signs suggest he was right. Some have begun to discuss the possible legacies such as the impact on local politics or immigration. However, the full legacy of the 2013 and 2014 Boston Marathons is still yet to be discovered. For now, as important as the conversation is, it is all just speculation as we take moments to reflect, wait for time to pass, and hope for peace. In an effort to look forward, just one day after the 2014 marathon NPR’s Morning Edition questioned how Boston and the marathon move ahead. 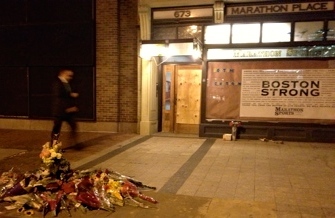 One broadcaster stated that he could not imagine an annual memorial service at the Boston Marathon. He said that the race was about moving, always moving, moving forward, and never standing still. An annual memorial service would feel static, not progressive. And while Boston will likely craft a permanent standing memorial, he proposed that placing one in Copley Square also does not seem fitting. Instead, he suggested that a more appropriate option would be a space tucked away from the hustle and bustle of the commercial center where people could go to privately reflect. I tend to agree. If this year’s race was an exercise in moving forward, one has to wonder how that forward motion looks from here. Surely it doesn’t look like a motionless, staid monument near the finish line. Not yet looking back at every turn. Knowing that some day, when our communal consciousness has further healed, the sports historian will be there to look back, record the history, and create the exhibit. Thanks Shelby! That means a lot coming from you. I know you have a unique perspective on the Boston Marathon. Thank you for this thoughtful perspective, Kathy. I am involved in creating an archive for The Crosses of Lafayette (CA). I recently completed an exhibition of Binh Danh’s photographs of this memorial and will help the community of volunteers (who have created and maintained this site installation for 9 years) envision a transition to permanence. Carol- I am so thankful the post is helpful to you. Transitional times of grief offer such a unique opportunity for the museum professional. I do hope you will continue to share with us what you learn along this journey. I work for the 9/11 Tribute Center, a small museum built just a few years after 9/11 (not the Memorial & Museum, but we’re nearby) and founded by survivors, first responders, and family members. It is very similar to “Dear Boston” in that it is more so created to heal than the typical historical museum. While we have had several teachers say they will not bring their class here because it is still too real for them, we have hundreds of teachers and volunteers who come because they find it gives them a place to reflect and to have closure. Some of our volunteers even joke that it is “cheap therapy” for them because it gives them a place to tell their story to interested listeners. I think most people I’ve met would agree that a year is not too soon for any impactful event to begin to educate the public, if a museum is done right, rather than a “helicopter view” (as it can often be mistaken for insensitivity if done too soon) early exhibitions should focus on the human side of an event and recognize the personal stories that make up history and current events. In my opinion, what better time to teach about an event than when those who lived it are there to tell? Sarah, I agree with you. The immediate out pouring of emotion and commemoration is such a powerful part of the healing process and the archival process. The hard debate for museum professionals, as I am sure you have seen, is how much interpretation to give beyond a re-telling of the facts and personal stories. I like what you say here about focusing on the human side- that seems like a great way to be true to the survivors recent memory. A lot of people are looking forwarding to seeing the 9/11 Memorial & Museum when it opens. I know the entire staff has been working very diligently on this delicate project and I have no doubt it will be an important part of the healing process.